BEIRUT • Iraqi forces have captured the biggest town under Islamic State in Iraq and Syria (ISIS) control in Iraq, Prime Minister Haider al-Abadi said, driving another nail into the coffin of the Islamists' self-styled caliphate. Mr Abadi hailed the "liberation of Al-Qaim in record time" in a statement on Friday, just hours after Iraqi troops backed by local Sunni tribal militia fighters entered the key town on the border with Syria. 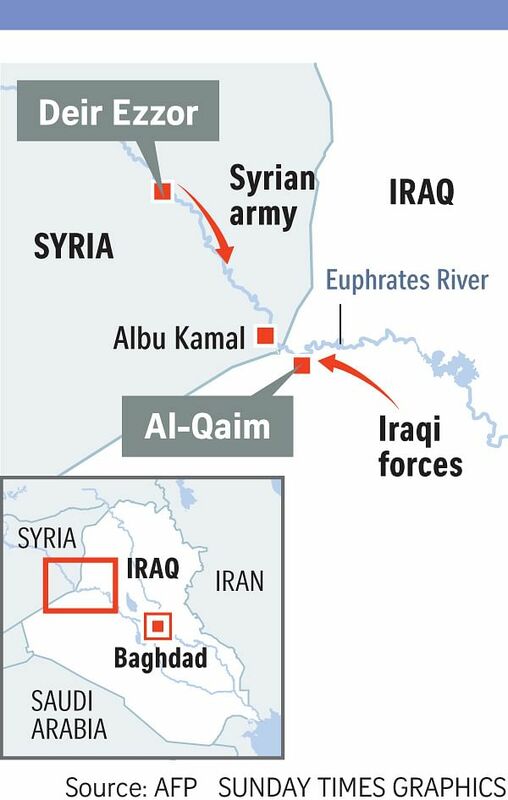 The fall of Al-Qaim leaves ISIS fighters in Iraq holding just the smaller neighbouring town of Rawa and surrounding pockets of barren desert along the Euphrates River. That is all that remains in the country from the vast swathes of territory that the group seized in 2014 as it rampaged across Iraq and neighbouring Syria. Earlier last week, Mr Abadi said Iraq would soon be able to claim total victory over ISIS in Iraq. The US-led coalition supporting Iraqi forces with air strikes had predicted that the battle for Al-Qaim would be the "last big fight" of the punishing military campaign to dismantle their brutal experiment in statehood. But the town appeared to have fallen in lightning time after commanders announced that Iraqi troops had pushed into the town of some 50,000 inhabitants on Friday morning. Though small, Al-Qaim has been an important town for ISIS. US and Iraqi intelligence officials have said the militants used Al-Qaim as a safe destination for their top commanders and leaders as battles raged in larger cities such as Mosul earlier this year. Iraqi Shi'ite militiamen who participated in the fight for Al-Qaim will now take on the extremist group in the Syrian border town of Albu Kamal, according to the militia's spokesman. Mr Jaafar Hussaini, the spokesman for the Iran-backed Kataib Hizbollah militia, one of the Popular Mobilisation Forces (PMF) fighting alongside the Iraqi army against ISIS, was speaking to Lebanese television channel Al-Mayadin on Friday. "Albu Kamal is in missile range of the Iraqi forces in Al-Qaim. The presence of our forces on the border with Albu Kamal means there will be a new front in the confrontation with Daesh," Mr Hussaini said, using an Arabic acronym for ISIS. The Syrian army and allied Iran-backed Shi'ite militias, supported by Russian air power, are approaching Albu Kamal as part of their own offensive against the ISIS enclave straddling the border between Syria and Iraq. They were advancing across the desert south-west of the city and along the Euphrates River from the north-west. The Syrian government declared victory over ISIS in Deir Ezzor, the biggest city in eastern Syria, on Friday, after two months of battle. Army Major-General James Jarrard, commander of the US-led Special Operations joint task force fighting ISIS, said in a news briefing on Tuesday that there are probably between 3,000 and 7,000 ISIS fighters left throughout the Euphrates River valley, from Deir Ezzor to Al-Qaim in Iraq. Albu Kamal is in missile range of the Iraqi forces in Al-Qaim. The presence of our forces on the border with Albu Kamal means there will be a new front in the confrontation with Daesh. MR JAAFAR HUSSAINI, spokesman for the Iran-backed Kataib Hizbollah militia, on fighting ISIS in the Syrian border town. In August, Lieutenant-General Stephen Townsend, the outgoing overall commander of American forces in Iraq and Syria, said he believed ISIS leader Abu Bakr al-Baghdadi was hiding in the vast desert region that includes Al-Qaim.